Madison FUN is working in partnership with Madison Parks, and other local environmental groups to co-sponsor year-round free nature outings. The excursions focus on bringing nature and water-related education to people of all ages. These experiences provide a way to get children and their families to appreciate the environment. The program recently expanded to 96 outings per year at various sites throughout the Yahara River Watershed. Past event sites include various lakefront parks, such as Tenney, Turville, Warner, and UW Lakeshore Preserve. Additional past sites include Starkweather Creek and wetlands such as Cherokee Marsh and Edna Taylor. 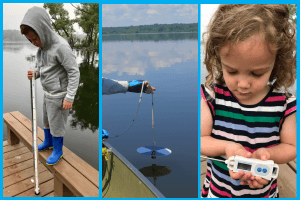 Wetland restoration, aquatic dipping, life beneath the ice, geology of the Yahara Basin, and citizen science are just a few of the water-related learning experiences featured in the past. Each educational outing averages 20 participants, with some presentations involving more than 50 children and families. Volunteers from Madison FUN also provide educational resources for Sherman Middle School and for the Warner Park Kids Summer Camp. Children are given opportunities to discover Starkweather Creek from a canoe, explore the Native American Lake Monona Water Walk, and attend Goodman Family Fun Nights. One of the children’s favorite activities is dipping for tadpoles and other underwater surprises! How will the grant expand the program? Madison FUN and Madison Parks are working to engage children and their families through educational nature recreation. The program will provide hundreds of people an opportunity to learn about our Yahara Watershed every year. Focusing on nature allows children to develop an appreciation of our lakes, and in turn want to connect with and protect our waters. Thank you to Madison FUN and Madison Parks for bringing this program to the children and families of the Yahara Watershed! Clean Lakes Alliance feels privileged to invest in bringing conservation and environmental education to southern Wisconsin.